I make my own wine because it saves me a lot of money. Canada has some of the highest liquor prices in the world, and the provinces I live on the border of – Alberta/Saskachewan – have the highest liquor prices in canada. I think the bare bones absolute cheapest bottle of wine is about 12$ – that’s for a 750 ml bottle. By my calculations my homemade wine costs about 1/10 of that price. These are my batch-by-batch notes based on the tutorial I wrote at http://fivegallonideas.com/1-minute-wine-recipe/ . I believe my tutorial is the best online for beginners because it’s exceedingly simple, and requires an investment of less than 5$ in winemaking equipment. Some people like sweet wine – this batch tastes a lot like a port wine. A bit too sweet for my palate. In my 2.84 liter jug of grape juice, I added 3 full cups of sugar. The juice started at 8% potential alcohol – then I measure after each cup of sugar that I added. 1 cup, 11%. Another cup, 13%. A third cup, 15%. Perfect. Or at least that’s what I thought. Although my yeast is rated at being able to ferment up to 18% alcohol, in this wine it topped out at about 13%. I added enough sugar at the beginning of the batch for 15% alcohol. This means that the final 2% potential alcohol didn’t ferment out, making the wine pretty sweet. I think the final 2% will eventually ferment but it may take up to 6 months. I’ll probably finish off this wine before then – Brittany says this sweet wine will probably taste good with soda water. I took the airlock out a few days ago, and it’s still fermenting very slowly so I unscrew the cap to let the excess CO2 out every few days. The risk of it blowing up is pretty much nothing, my vessel is strong plastic that expands if it has too much air inside. 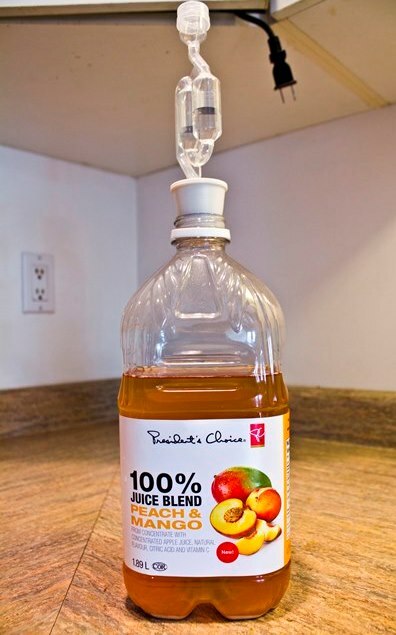 My brother used to make apple juice wine inside its own bottle similarly to my tutorial without an airlock and he never had a problem. He just had to make sure to release the CO2 every day. Since this is my first batch I don’t have any extra containers to “rack” my wine into, so I think I’ll just let it sit on the yeast until I’m done drinking it. I worried very little about sanitation with this wine, and have absolutely no off-flavors. I’ll be a little more careful in the future when I’m reusing a washed bottle rather than brewing juice in a sterilized environment. Batch capped on June 23, 2013. Would have capped sooner, but I was away most of June. This time I added the exact amount of sugar that was able to ferment out last time. Two cups of sugar brought me to the 13% potential that matched the 13% brew I made with my yeast last time. I also dumped out less grape juice for myself this time because I didn’t really see any problem with “krausen” in my last batch. Maybe krausen is more of a beer problem and less of a wine problem. 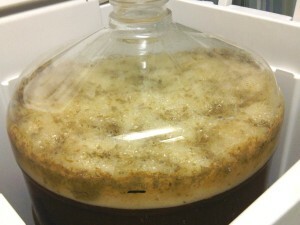 Krausen is gross, I’m happy to not see it in my wine. Means less fussing. It’s bubbling happily and should ferment out in the next couple of weeks. Hopefully my yeasties will eat all the sugars and I can end up with a wine that’s dry as a bone. I think in the future I’ll try experimenting with adding super concentrated grape juice to my regular grape juice. I think it’s a pretty good deal over at the brew store and will certainly make the wine both taste better and taste better sooner. Because the more white sugar you’re using to brew, the longer you have to let your wine site before its taste matures. July 9 2013 – I measured the sugar content of Batch 2 today for the first time. Out of an initial 13% potential alcohol, 12% has already fermented out, leaving just 1% left to ferment. It’s been bubbling for 10 days, and it’s just about done. I tasted it and expected something horrendous, but it’s surprisingly drinkable for a wine that’s not even done brewing yet. I noticed more of a haze in this wine, and am not sure if it’s a pectin haze or a haze of the still-active yeast. Either way, this haze will settle in time. Here’s batch 1 and 2 side-by-side – you can see how cloudy batch 2 is (the one on the left) compared to batch 1 on the right. When I measure with my hydrometer, I normally just dump the wine I used to measure right back into the fermentation vessel. This goes directly against agreed upon best practices because most homebrewers are extremely picky about sanitation – but I’m happier pushing the limits to eliminate fussing wherever possible. If I ever run into problems doing it this way, I’ll be fully transparent about it here on this journal. Batch capped on July 14 2013 @ 0.5% potential alcohol remaining. July18 2013 – If anything, this wine’s fermentation has sped up since I capped it 4 days ago. I release the co2 every day or 2 and quite a bit of stored air escapes each time – making the bottle settle visibly. I’ve started drinking it, and let me tell you. It’s absolutely perfect. It’s dry as a bone, just the way I like it, barely a hint of sweetness at all. I can no longer really taste the saccharin taste of the common Concord grape in it either. Fermentation may have sped up due to the wine now being stored in a dark place. A veteran winemaker commented on the main 1-minute wine article to inform me that would happen, and it seems to be happening now. I’m willing to bet that this wine will ferment into negative territory, which isn’t uncommon for wine to do. I can’t wait! I would like to present my batch 2 wine next to another dry red in a blind taste test. I am quite confident that it would be hard to tell apart from a moderately priced red wine from the liquor store. I would consider this the greatest of victories for the 1 minute wine recipe. I’m really happy with batch 2, and will probably make lots of identical brothers for it to hang out with. I enjoy drinking drier wines more than sweeter ones, so I will probably only brew another Batch 1 if Brittany want a sweeter red wine once in a while. I didn’t bother measuring this one with the hydrometer because I already know that it will measure 13% potential alcohol, give or take a hair I am sure. I stopped making wine for a few months because we had 30 bottles of wedding wine to work through. Now it’s all gone and I’ve entered back into the swing of things. We filmed this batch on our new Canon T2i and published it to youtube. I used 2 cups of sugar just like I did with batches 2 and 3 and gave it to my camera operator as a gift. After 3 weeks, he reported it tasting way too sweet. His house is an old drafty thing which I suspect slowed fermentation down to a crawl. Batch 7 – How small can we go? I did something different with this one. To prove you can use any juice to make wine, I started a batch of peach-mango wine. And at 1.89 liters, it’s approximately half the size of the red grape wines I was making before. I hypothesized that a carboy half the size would make fermentation much slower by a factor of 4. To make a success even less likely, I only added enough sugar to bring the potential alcohol to 11%. It took a little bit longer, but fermented out beautifully. It took about 3 weeks instead of 2 so my guess of it taking 8 weeks was thankfully dead wrong. Now about a month old, it’s clarified nicely which indicates nearly universal yeast hibernation. The taste is top-notch. I suspect partly because of how sparing I was with the white sugar. I’ve also got another 1.89 liter bottle of white grape/pear I’m starting today. This entry was posted in Saving Money. Bookmark the permalink. Have you thought of using a cider or apple juice, or even pear? Thanks off to get my lock and juice. Held down by rubber bands. No air lock. Interesting! I had no idea wine could be made this way. Can’t wait to hear how your 2nd batch turns out! Is there any way to subscribe for updates on this blog? Well… you could subscribe to the RSS feed @ http://justscrapingby.com/feed – or do you prefer email updates? I suppose I could set that up on this site just like I have set up at Five Gallon Ideas. I want to try this but I don’t drink a lot very often, although I do like it. Is there a way to store these bottles so that they won’t turn rancid or nasty and will keep? It would be lovely if I could make some and save it for Christmas pressies or just over time. Thanks! As a matter of fact, making wine is how you keep juice preserved The alcohol will kill any and all spoilage agents, and the higher your alcohol content the truer that will be. Wine will normally only get better with age. But if you’re storing super long term, I would store it in glass – not plastic – and in a cool dark place. Question, I am doing this right now, I am 11 days in to the 1st batch. My air lock stopped bubbling so I went to rack it. It is very bubbly like 7 up. Suppose that is because it was not done, but the airlock stopped. I strained it and cleaned the bottle and put the air lock back on. Do you have any suggestions. Do you think I messed it up??? Bubbly like 7up is what happens when it’s still fermenting in the bottle. It means that it was still letting out a little bit of carbon dioxide. In fact it’s the same exact carbon dioxide that makes 7up carbonated. And just like 7up, you can get rid of it by letting the wine go “flat” again by letting it sit for a few hours uncapped. You didn’t mess anything up, it sounds fine. For next time, you could let it ferment a few days to a week longer so it doesn’t ferment in the bottle. What you did accidentally is actually called “bottle conditioning” – you can look that up to find out more about it. My dry results have somewhat of a bitter taste. Any ideas why? How long did you age it for? You will get an astringent taste with immature wine, does that sound like your problem? I fermented it two weeks (champaigne yeast). Then kept it in a cool dark place for about two more weeks. Not long enough? By the way, this is a fascinating undertaking. I’m slowly learning what works and what doesn’t. Thanks for all the information. It could also be that you just need to age it a lot longer. Sometimes it can take wine 6 months to become tasty. Or it could even be that your yeast variety creates a more bitter beverage that isn’t to your taste. Some raw ingredients are just more bitter, just like some varieties of coffee are more bitter. I make wine the same way as you do but with one difference. “finish line”. So you never run the risk of having a stopped fermentation either. Anyway, enjoying your journal and I’ll post back with my results in a few weeks! ok first batch is done. Turned out to be about 17 per cent.Now I’m starting a batch of apple juice to make “apple cider” . After I gather my supplies, I wish I could start a batch with you, and follow along as you do the steps. I am a hands on type of person. I come more near remembering and retaining what I have learned rather than memorizing it for a short time, then forgetting. What are your thoughts on this? Glad to hear you are getting into wine making! Due to the popularity of my tutorial I’ve just started work on a professionally made video of the 1-minute wine recipe where i will make a batch live. If you subscribe to my youtube channel or the Five Gallon Ideas email list you can see the video when it comes out. I made wine with grapes from California with my goomba in his wine cellar for over 30 years however due to his health issues he/we are not able to make it any more and all of his wine making equipment was put into storage for future use by his grandson. I like your 1 minute process and will be trying it soon. I would like to Join your Five Gallon Ideas e-mail list. HI, I am a Chef in Afghanistan and came across your site. We have been brewing beer here for a while and I thought, WHY NOT WINE?? so I tried to make a batch and put WAY too much yeast in. BIG MESS!! well I tried you method out with a carboy with a 3-3-3 version of your recipe. 3 lt grape juice 3 cups sugar and 3 teaspoon yeast. We don’t have any fancy yeast just regular bakers yeast. anyway in the fermenter now with air lock sitting under my desk. I will let you know how it comes out. thanks for the great site. GREAT! Wow this is a cool story. Your wine might be low alcohol using baker’s yeast but since you put in a lower amount of sugar you should be ok. Yes I would like to know how that yeast works out please update once its ready. And let me know the brand of the baker’s yeast if possible. Sorry 3 GALLONS not 3 Lt that would be awfully sweet wine. I just mixed my first batch of wine today! I can’t wait till it starts to bubble. My husband and I drink a glass every night of sweet. I gets expensive every week for a few bottles of wine. So I told him I would like to try to make our own. I’m a little fuzzy on the hydrometer but I think I understand it. I’m so glad I found this on Pinterest. Thank you . What was the measure of sugar that you put into your 1/2 gallon bottles? I did 1 cup and ended up with 11% sugar and it was good. You could go as high as 1 1/2 cups if you wanted a tad higher alcohol content. I am so excited to try this, but also intimidated to try. It seems almost to easy. I purchased my supplies today and am probably going to get it going later this week. My fiance is very skeptical this will make a decent wine. Great idea to start small. People will be skeptical that it is so easy but there’s a lot of things like this that are easy to make yourself but no one really bothers anymore. Belive it or not making your own beer is a lot more work. What do you think of dehydrated cane syrup as a sugar substitute? Or refined berry sugar? The white sugar’s best benefit i think is that it IS highly refined. I juiced several gallons of huckleberries and canned them with no added sugar. Do you have any idea how much sugar I would need for a gallon? Thank you, very interesting tutorial. Here’s a good article on the chemistry of winemaking …..
For a kg of fruit use 1.5 kg of sugar – the fruit itself contains sugars. A little over twice as much water as there is fruit. 4.5 L of water to 2 kg of fruit. A pack of yeast – which is about a tablespoon. A cup of black tea, some raisins 1/4 cup or a bit of lemon juice. 2-3 squeezed lemons, add the tannic acids. Remember raisins also contain sugar…. When an inch of sediment is in the bottle from dead yeast is in the bottom – drain the liquid to a new bottle. When it is finished fermenting and ready to age – add a bit of brandy to the mix, that prevents it turning into vinegar over time. Hey this is great, love the info. 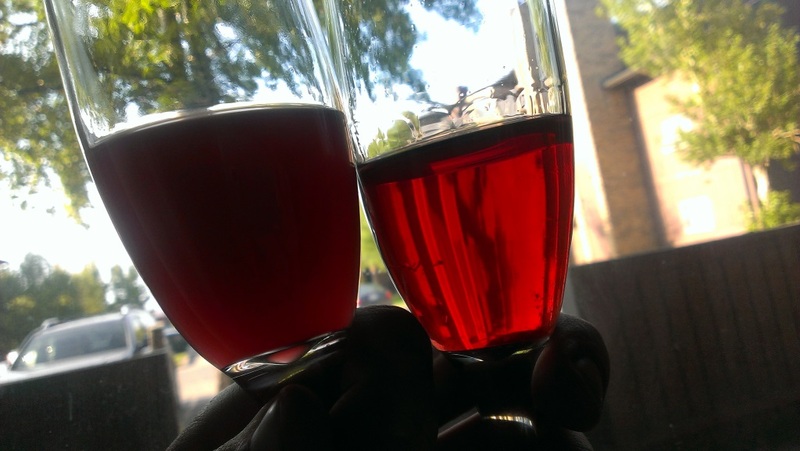 I just started making mead from a simple recipe October 1, 2014. Then I ran across your recipe. Fantastic! I started just as you say and have since subbed raw honey for sugar at the rate of 1/2 cup honey for 1 cup sugar and am getting similar potential readings. Tonight I’m going to try and sub juice concentrate. I’m now using the 1.89 jugs since that’s what is available here locally. The sugar content I start with is usually 39 or 40 depending on red or white grape. 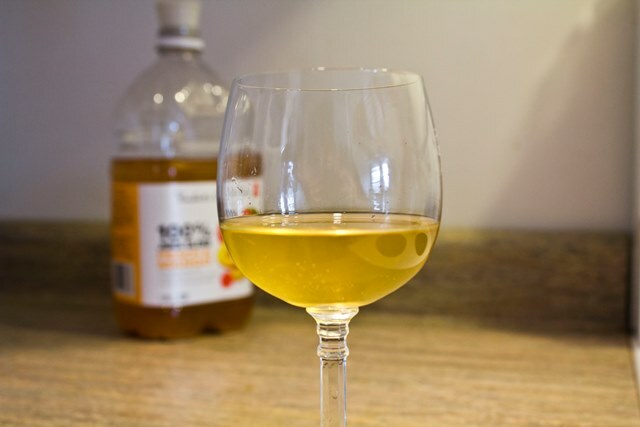 I’ve tried some ciders and interesting fruit blends in my small batches and am sticking with your “nickel size” champagne yeast rule of thumb. The concentrate I got tonight is 29g sugar and I plan to use 12 fluid oz (thawed to room temp) per 1.89 jug. I’m excited to get a potential reading and sure hope this works! Can you, or someone, clarify what you mean about using concentrate in lieu of sugar? I’m picturing that you are adding to the grape juice more concentrated frozen grape juice? Just to increase the sugar/taste content? That’s exactly right, frozen grape juice will have much more sugar per ounce than a container of prepared juice. You can add this “concentrated juice” to bring your must up to the correct specific gravity for brewing, and skip using white sugar completely. Make sure you pitch the yeast when the must is at room temperature. I love all the info! Actually this first time I made wine… Or more appropriately, hooch, it was Made from the bottle the wine came in with bread yeast. Yuk. I decided I wanted to give home brewing another shot and I have a question that I don’t think you touched on. When a recipe calls for whole fruit how much juice should you use in it place? Or vice versa? I have this one excellent sounding pomegranate sparkling wine recipe and it calls for 7 lbs fresh pomegranate. How should you convert that to juice instead? Is it just trial and error? Or is there at least a starting point/rule of thumb? Came across your website and decided to give your one minute method a try. Put together the first batch, one white, one red. After four days the red looks good but the white became cloudy (since day 1). Could it be that it clouded because I shook the container after adding the yeast? The cloud could just be the yeast suspended in the container. Your red should be cloudy too but it might be too dark to see it. Been doing my own wine from store bought juice for about a year now. I’ve found that running a batch dry also makes it ‘flat’ tasting and uninteresting with no finish taste at all unless aged a while. My solution is green tea. 2 cups per gallon. Plus the yeast love the tea tannins. wow that’s a really neat idea. I want to try it! I think instead of brewing 2 cups of regular strength green tea, I will try to brew 1/2 cup of 4x strength green tea. Hey Buford, can you provide the recipe please? With all the ingredients and portions? Thank you. What % of unfermented sugar would be ideal for a sweet wine (say, moscato)? Here’s a rough idea for some common wines …. in grams per liter of residual sugars. How come some wines are dry and some are sweet? Basically, when wine making happens, yeast eats sugar and makes ethanol (alcohol) as a by-product. A dry wine is when the yeast eats all the sugars and a sweet wine is when the yeast is stopped (usually by chilling the fermentation) before it eats all the sugars or if there is more sugar than the yeast can use. This is why some sweet wines have less alcohol that dry wines. Exact levels of residual sugar are actually quite difficult to taste with our “naked tongue.” Even highly trained wine tasters often have trouble identifying RS in wine–but you can learn with practice. The main reason we can’t taste sweetness that well is because other traits in the wine, including the acidity level and tannin, distort our sensitivity to sweetness. You can test this oddity yourself by tasting plain sugar and then tasting the same portion while biting into a lemon. The acidity will cancel out all or most of the sweetness on your tongue. I started my batch of wine 5 days ago and I noticed there was a bit of undissolved sugar on the bottom. So my question is if I took off the airlock and shook it up a bit more would I ruin it? Not at all … it will all settle while sitting to ferment. Either way the yeast will find the sugar and eat it up anyhow… as much as it can use – if it finishes fermenting and there is still sugar – then there was too much to start. I have 3 batches of wine making now. I’ve made my own air locks by using tubing stuck in the top of the jugs lid. I used a hot wood burning tool to do so and found tubing a tad larger squeezing the tubing in place and running other end Into a bottle of water using the same method and punched a second hole into the side of the water bottle above the water line and inserted a short peice of tubing to allow gas to escape. So far everything is working great. I also found that boiling water and adding the sugar to the water and stirring the water until it was clear allows all the sugar to dissolve much better. I allowed the sugar water to cool then added to the juice. I found 1 cup of water and two cups of sugar blends nicely with the juice. Just some ideas I have been toying with and work well…..
Hey there, just though I’d add something. If you’re talking about finished wine (i.e. ready-to-drink) then by blending it you’re introducing oxygen which can greatly enhance the flavor of the wine. This is why people often uncork their bottles and let the wine “breathe” for an hour before drinking it. I am starting to do my first batch. 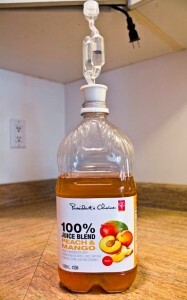 I am using Tree Top apple juice in the gallon bottle. I heard that if I use brown sugar and white sugar It will give it a Carmel taste ( This is what I want) Also what is your take on adding a few raisins in with this mix? Great site and info…have been making wine just the way you discribe it for years… Glass one gallon jugs…..did want to ask, you talk about getting away from white sugar but I didn’t see what you use instead. Honey -1/2 cup subbed for each 1cup sugar. Frozen concentrate fruit juice – use hydrometer to test for desired alcohol content. Cane, raw or brown sugar sub cup for cup. Be creative, have fun! 70°F is best, lower will slow the process. Def add yeast – a nickel sz per gallon or 4 litres. Have fun! Question, if I make grape or apple wine in a small bottle, like the grape juice sized one, and let it ferment for 2 weeks, can I just go ahead and drink it? If you drink it too soon it will taste like yeast – pretty much harmless except for tasting odd…. think of drinking a container of weak grape flavored yeast water. Fermenting longer makes it more alcoholic and a better wine flavor …. aging for a while longer – a few weeks up to a few years lets the fermenting process completely finish for a nicer taste and settles out all the sediments, cork stoppers are used to allow air, that finishes the process and lets the wine “breath” so it gets the best possible taste over time. unless I wait 1-2 more weeks. after that it gets really dry. whats your opinion? I have been making your grape juice wine recipe for 3 mos, I love the sweet taste after 3 weeks, I think the alcohol level is about 7% . How can I get higher alcohol without losing this sweetness that I love? Add more sugar and yeast …. they combine to make alcohol… fermenting time also adds to alcohol content …. more fruit and less water gives more flavor. How can you let be CO2 out everyday while using a normal juice cap? I live in a country where there are no possible way to find supplies like the ones you mentioned to make the wine. Therefore, I need to use the simplest way possible with a bottle of juice, sugar and baking yeast. Any suggestions? I’ve made one good batch and three bad ones so far. One of them I believe is over oxidized, any suggestions on how to cure that? @Samantha: Some people use a tube or straw and then just stick the other end into a bottle of water. Google search “homemade airlock”. Does the juice have to be 100% juice from concentrate? I’m having trouble finding juice concentrate without corn syrup. I could just be blind but could you suggest a list of brand names? Why not just go buy some wine grapes (wine grapes are really tiny grapes, the size of a large blueberry, with a high sugar content) or even a bunch of normal grapes (table grapes are less sweet) – crush them up in a pot minus the seeds if they have any – and simmer them over low heat – add sugar and water and then drain off the liquid … use that for your wine…. really simple. Or use apples, pears, peaches or any other fruit, raspberries, strawberries, cherries, blackberries – even canned fruit will work, drain off the liquid and use the fruit …. … And are the calories about the same as what the juice says. Taking in account the added frozen juice. Does the chemical changes in the sugar add or subtract calories? Just curious – if one is drinking alcohol which in general is not really good for a person in excess – why would a person ever worry about how many calories it has ? It’s kind of like smoking cigarettes and asking is one brand has more oxygen content than another brand…. I live in an apartment. Will this smell up the whole building. The only thing you have not mentioned is how much yeast to use. Probably the yeast/sugar ratio will dramatically affect the taste and fermenting times.